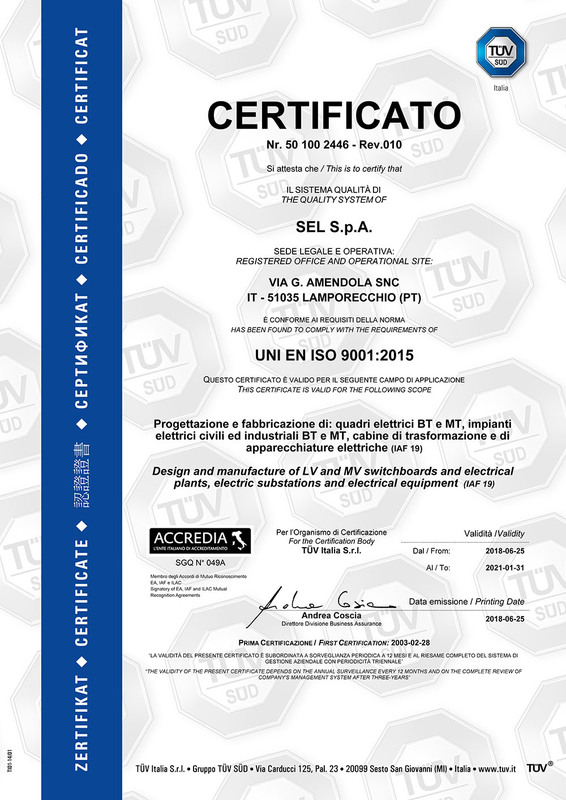 Quality & Certificates – SEL S.p.A.
All the manufacturing process follows a quality procedure certified by TUV in accordance with ISO 9001:2015. The production conforms with the specific quality manual which is updated regularly in the way that it reflects the most recent applicable quality control procedures. CNAS Shanghai Electric Power Transmission & Distribuition Testing Center Co.,Ltd. The Management, aware of the need to continuously satisfy the Customers’ expectations, has decided to create a Quality Management System according to the UNI EN ISO 9001: 2015 standard. the involvement of personnel at all levels in the implementation of the Quality System, with the awareness that it is a fundamental resource for achieving the objectives and for the development of the company. operate in compliance with the laws in force and with the prescriptions and procedures established internally.